Enjoy the best of tropical living at Baan Ya Kha. With five bedrooms, a capacious common living area and a generously proportioned indoor-outdoor pool, the villa is ideally set up for travelling parties of 10. Vacationers may rent the neighbouring Baan Yai to accommodate up to 20 guests. Five bedrooms are spread out over three standalone bungalows. Similar to the common areas, each of the rooms are dressed in earthy hues of creams and browns to create a cosy and restful ambience. Air conditioners and fans keep the interiors cool and comfortable. The first bungalow houses two bedrooms, both outfitted with king beds and a bathroom with toilet and shower recess. 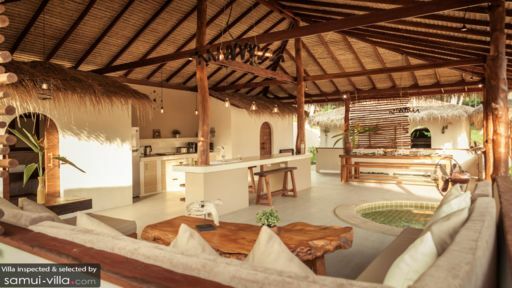 The second bungalow features a bathroom and two bedrooms; one of the rooms comes fitted with a king bed while the second is equipped with twin singles. The third bungalow contains a bedroom with king bed and private en suite. 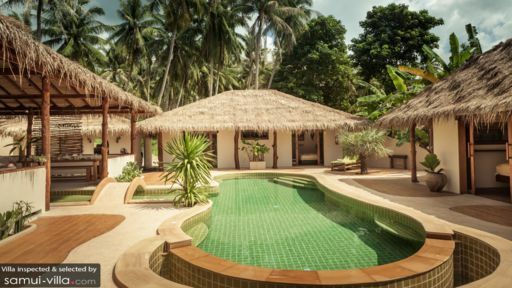 Baan Ya Kha boasts a spacious outdoor compound where vacationers easily spend hours soaking up the tropical vibes. The highlight here is the indoor-outdoor swimming pool; it takes a free form shape, is equipped with pool benches and flows indoors towards the main living pavilion. A shallow wading area makes the pool a child-friendly amenity, and a non-chlorine pool system means that the waters are free of harsh chemicals. 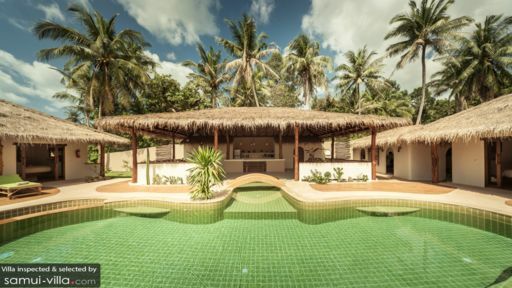 By the poolside lies a thatched roof pavilion furnished with recliners and a hammock; it’s a favourite hangout for sunbathing and shaded siestas. When dusk falls, head outdoors for sundowners and watch as the pool waters become illuminated by a beautiful violet glow. The living spaces at Baan Ya Kha wrap around the swimming pool. Most of the social gatherings happen at the main living area, which boasts an open-air concept and open layout. An L-shaped couch littered with cushions centers around a wooden coffee table in the indoor lounge. It adjoins an open kitchen equipped with a full range of cooking amenities and a breakfast bar, and extends out to include a dining area furnished with a dining bench. Baan Ya Kha enjoys daily housekeeping, along with pool and garden maintenance. A total of 10 CCTVs are placed all around the property to keep the compound secure. Villa vacationers will appreciate Baan Ya Kha’s close proximity to an array of local amenities and attractions. Hin Kong Beach is just 150 metres from your villa, as is a 24-hour 7-11 convenience store. Restaurants dishing out a variety of cuisines are located within 10 minutes’ walk; there’s Angels Bay Restaurant for seafront dining, Romanzo Tropicale for Italian cuisine coupled with amazing sunset views and L'Alcôve for French fare. Further out from your villa is Belgian Beer Bar. It’s six minutes’ drive away, with a menu that offers a wide-ranging selection of Belgian beers, Belgian fare and Thai dishes. For a vibrant beach atmosphere, take a 20-25 minutes drive out to Haad Rin Beach. It’s the most popular beach on the island, boasts numerous restaurants and bars and is the venue of choice for the island’s renowned Full Moon Party. Fit in cultural sightseeing into your day with a trip to the colourful Kuan Yin Temple, Wat Phu Khao Noi or the quaint fishing village of Baan Chaloklum. Khao Ra (50 minutes’ drive), one of the best viewpoints on the island is great for a half-day hike. Than Sadet Waterfall National Park (37 minutes’ drive) also allows for a scenic hike among its various pools. The surroundings are picturesque, and the cascading waterfalls lead to a gorgeous beach.